Edgar Arceneaux’s “A Book and a Medal: Disentanglement Equals Homogenous Abstractions” opened at Susanne Vielmetter Los Angeles Projects earlier this month. Challenging and compelling, the show is a triple threat of musts (must-see, -feel, and -experience) all in one. The exhibit features the contents of a partially redacted 1964 letter from J. Edgar Hoover and the FBI and part of the “Suicide Package,” blackmailing Dr. Martin Luther King by referencing his extramarital affairs and encouraging him to commit suicide. Another letter that serves as the former’s bookend came 50 years later as Bernice King, MLK’s daughter, urges her siblings not to sell their father’s Nobel Prize and bible (objects for which the show is named). Arceneaux explores the complexity of iconicity and monument-making; history and storytelling; and forgetting and memorializing. 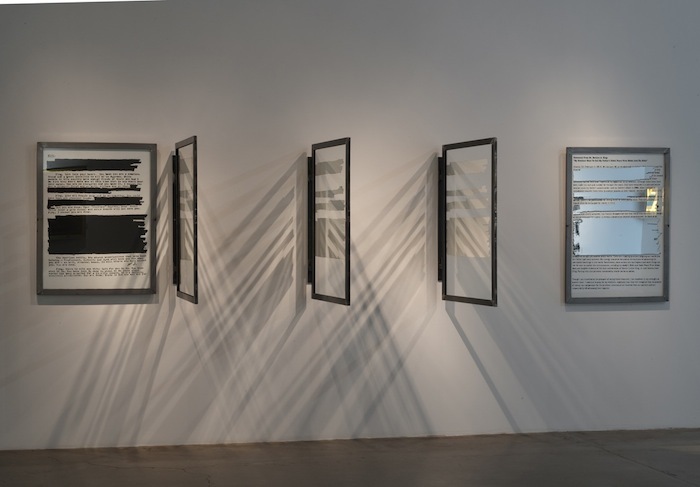 Using mirror installations and the shape of the redacted letter as a recognizable and repeated template throughout the exhibit, he creates a mood of intrigue, redundancy, and disjuncture. Experiencing the show, I often lost track of when I was seeing through a window to another side of the gallery and when I was seeing myself and the exhibit behind me in the reflection. At one point I looked up to see what appeared to be my friend across the way, only he looked like he had my legs. This disjointed reality Arceneaux creates does what it should: it jars, it jostles, and it forces the viewer to consider the cacophony of themes, references, and histories presented. I left the show with 100 questions and was lucky to interview Arceneaux for insights on his goals, process, and intent. “A Book and a Medal” runs through October 18th and is not worth missing. Ellen C. Caldwell: I love how you continue to reference and explore the intersections of science fiction and the politics of the past and future. There is a real dynamism there… “Spock, Tuvok, Tupac” is one example I am thinking of from 1997, but then there have also been the more recent ones like “The Slave Ship Zong” and “Detroit Monolith, It’s Full of Holes” (both 2011) that tie in Stanley Kubrick’s “2001: A Space Odyssey,” political history, and techno music. Similar themes run through your current show as well and I am wondering if you could explore some of this a bit? I think it is rare to see science fiction addressed so specifically in the art world and I really appreciate it as a tool for opening wider conversations. Read the rest here at New American Paintings.